Last night I had a dream that I needed to start my own blog documenting my challenges, struggles, rewards, and excitement about be a Mommy. 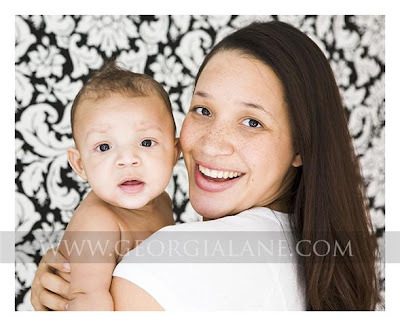 Being a Mommy has been the most rewarding and challenging job I have ever had....and I love EVERY MINUTE of it!!!! So hello bloggisphere...my name is Aja J'Nae Mann. I am a first time mommy to Aiden Joseph Douglass...a.k.a Prince Aiden. As of today he is 8 months old...weighs 23 pounds and is 30 inches long!!!! Yeah I know...he is a giant. He is healthy and happy and the best thing that has every happened to me. I tend to get a lot of emails and phone calls for advice about things, so I think that this will be a great avenue to spread some of my mommy knowledge. My Mommy Diary will list some of my favorite things....well a lot of my favorite things because I am obsessive about Aiden having the best and safest of everything. I will talk about funny things that happen to me and not so funny things...lol. I will talk about conversations that I have with my other Mommy friends (and I will change their names for their protection...lol) because they are some of the funniest people I know. Where's my blog J'Nae? Aiden is a chunky monkey! Monkey, just like his mama!